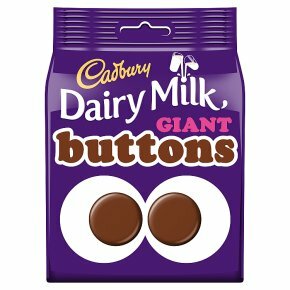 Cadbury Dairy Milk Giant Buttons are shareable bags of fun shaped creamy milk chocolate. Ideal for sharing with family and friends. These bitesize treats are made with fresh milk and made with ethically sourced Fairtrade cocoa. Suitable for vegetarians. Share the joy! On the go! With friends! Watching a movie!